Now it is possible to take stock - did the world achieve the Millennium Development Goals? A slide deck summary of charts and visuals on whether we reached our MDG targets is available to view here. At the turn of the millennium, the world’s nations set themselves development goals with the ambition to reach these in the following 15 years. Referencing the historic moment of their inception the UN named them the Millennium Development Goals or MDGs for short. The goals encompassed development in a broad sense, from increasing economic welfare of the poorest, to health and education, to humanity’s impact on the environment. Now for the first time we can look back and see how the world has actually done. This is only possible now – three years after the end of the MDG era in 2015 – as it often takes several years until the relevant data is available at a global level. Early assessments had to rely on extrapolations of earlier trends. As you can see in our analysis, today the most recent available data on many aspects is from 2015. So how did the world do? Did we actually achieve the MDGs that we set ourselves? The MDGs comprised of 8 Goals, measured by 18 Targets; the table below summarizes the track-record of the 14 Targets which can be assessed quantitatively – highlighted in green are those which the world has achieved and in red those where the world fell short. There is clearly more red than green, but let’s look at the good news first. Overall, the world achieved 3 and a half targets: MDG Target 1.A – halving the share of the world population living in extreme poverty – is a particularly important one and while most people are not aware of it, the world has actually achieved this goal. The achievement of MDG 3 meant that the gender disparity in education was closed at the global level. And MDG Target 6.C on malaria and tuberculosis was achieved as the world was able to reduce the global rate of new infections. For MDG 7 the world achieved half of this goal – while the goal for sanitation was missed, the world did reach the goal on providing access to safe drinking water. What is clear however, is that most of the UN’s development goals were missed. 12 of the targets are shown in red. The degree to which they were missed varies between several near misses and a few very clear and alarming failures. The MDG targets on which the world failed most miserably were the environmental targets in MDG 7 which called for a “reversal of the loss of environmental resources” and a “reduction of biodiversity loss“. While there were certainly some important successes – very positive trends in the decline of substances which deplete the ozone layer for example –, the global evidence shows that most environmental indicators regressed; global carbon dioxide (CO2) emissions increased approximately 50%; global forest area continued its decline; overexploitation of fish stocks increased; and the Red List Index concluded that “a substantial proportion of species in all taxonomic groups examined to date are declining overall in population and distribution”. On many other aspects of global living conditions where the world fell short of achieving the target, the world nevertheless made progress. Often the story is that the world has achieved progress, but not as fast as needed to reach the MDGs: the share of people in hunger fell, the share of children in school increased substantially, more women got access to reproductive health and contraceptives, the maternal mortality nearly halved, and the global child mortality rate more than halved. Substantial progress has been achieved in the first 15 years of the new millennium, but in most aspects not as fast as the achievement of the MDGs required. 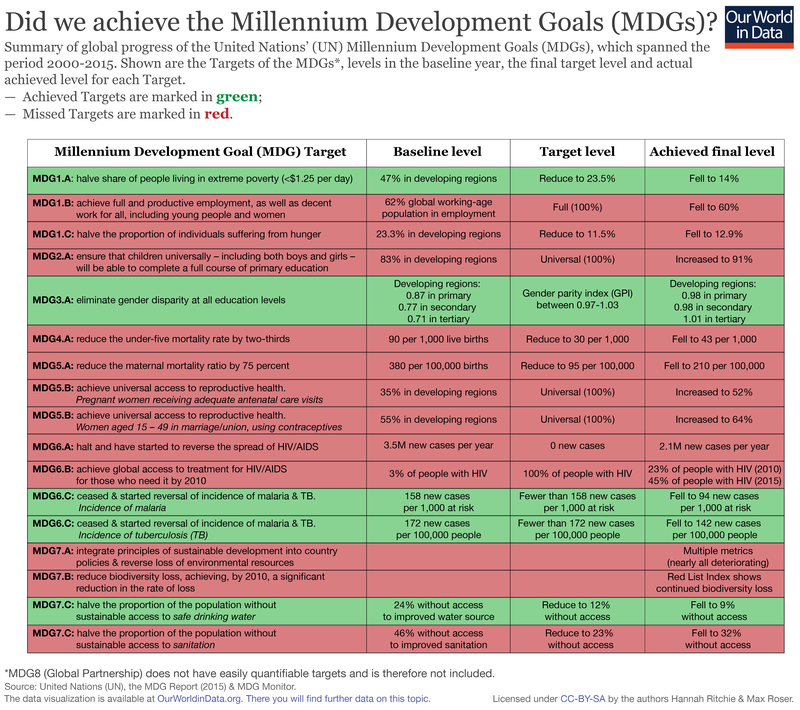 The table provides the summary, if you want to see the data on all targets you can study how the world has done on each MDG in our slide deck of charts and visuals which you can view here.